It is not a secret that sofas and armchairs are commonly exploited in our everyday life and that they require a lot of attention to look their best. Thus the in-depth sanitation that we offer our customers with comes at an affordable price, as the service is recommend once a year. Our most heartfelt advice to you is to turn to a professional company – such as us when it comes to your upholstered furniture; because the wrong detergents or treatment can rather tarnish them instead of bringing them to their previous glory. Within our work, we apply the latest top methods and trends, along with wonderful equipment, which is guaranteed to leave your upholstery as good as new. We use products and techniques that have been proven to be safe for your health and are therefore suitable for every non-leather sofa. Our methods can’t warrant the removal of all kinds of stains, but we’d still do our best to try. Be aware that if you have treated the upholstery with random products that have left stains, then stains might to be a subject to complete removal. We treat every case individually, according to the pollution degree, fabric type, etc. Most often, we use both steam machines and mild detergents. Our products do not affect the visual properties or the comfortability of your furniture. 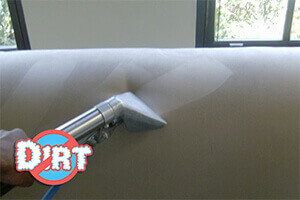 If you regularly use our Sofa and Upholstery cleaning services, then your furniture will retain its beauty and flawless look much longer than normal. Our cleaners are trained and qualified to use the industrie’s safest methods and the most efficient products. They will vacuum the sofa, review its state, apply the needed detergents, steam clean it and in some cases, even apply a conditioner. Since the steam cleaning works with water, your upholstered furniture will remain wet for a couple of hours after the work completion, so you should allow some time for it to dry. It normally takes between one and three hours, and if it is possible that fresh air is left into the room, this will allow the process to finish faster. In case that you want to book our services or simply have questions about them, use one of the methods of contacting our customer support service. Our customer-friendly operators will politely give all the needed information, help you out and give you a free quote. The customer support can be reached 24/7 by e-mail, phone or the contact form on our site.